California gubernatorial candidate John Cox speaks during the California Republican Party convention in San Diego. “It wasn’t President Trump that gave us one of the most expensive and failing school systems in the country. This is absolutely criminal to deprive our children of the education they deserve …the extra tax money they passed in Prop 30. 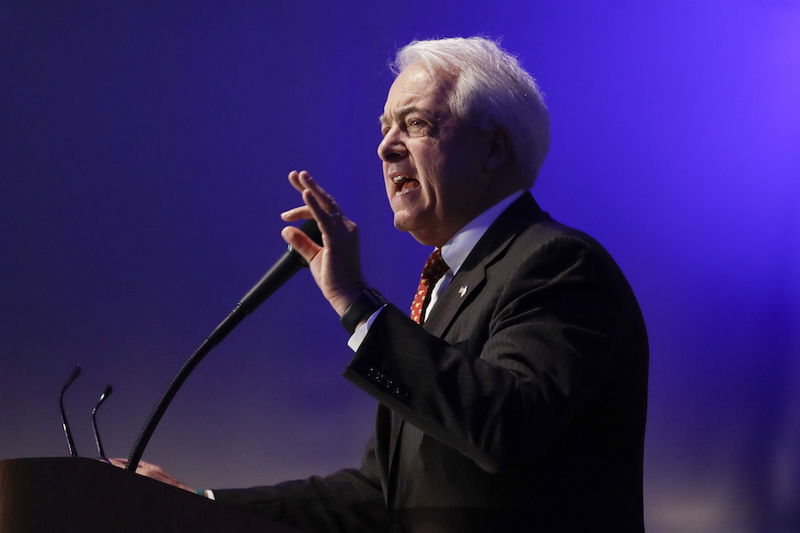 It’s not going in to the classroom, it’s going to administrators and pensions,” GOP businessman John Cox told supporters on Tuesday night after coming in second behind Lt. Gov. Gavin Newsom in the primary for California governor. What is your personal education background, and how has it affected your view of education policy? I attended public schools all the way through. My mother was a Chicago public school teacher, so education is in my blood as it were. And actually my aunt Ruth taught at Stanford Medical School on top of that — it’s all over my family, frankly. I grew up without a father; he left when I was a baby. My mom was the dominant figure in my life, and she was a teacher, and she would regularly bring me to school when I was 11, 12 years old to tutor the high school juniors and seniors. She was a librarian and reading teacher. It was an all-black school on the South Side — it was the same high school she’d attended in the ’30s, and she went back there in the ’60s. So what shaped me is seeing the impact of politics in the education system, because the principals she dealt with…were usually friends of the alderman — that’s how they got their nice, cushy jobs as principal … If you can have a good principal you’ll have a good school, but the converse is true, too. So if politics enters the picture, that’s a real problem. And, frankly, that situation has only gotten worse in the last 40 years. The other thing you ought to know is that I went to community college, and then worked my way through the University of Illinois … My educational experiences really have been shaped in terms of having to pay my own tuition bills — no scholarships, no loans. But it was affordable 40 years ago. That’s a huge, big difference. Today’s kids are leaving school with $200,000 debts hanging over their heads. I had no debt. Not because I was rich — not because I had a rich daddy — but because I worked hard and paid for it myself. But it was affordable. I could pay for it. What would you say is your platform or vision for education in California? Technology. Choice. Competition. Getting politics out of our education system. This state spends upwards of $60 billion a year on education and it’s controlled for the most part by politicians and, frankly, the unions that control in many ways the politicians. I want to put the parents in charge. I want to make it a consumer effort again. That’s the best way to make it quality. We’ve got to put the parents and the students first. Clearly I want teachers to have a big role in it, and I want teachers who view it as a profession, not a union lock-step job. The first step is more charters, of course. I’m absolutely in favor of more charter schools, more entrepreneurial opportunities for education and competition. But I also ultimately think we need to go to vouchers. We need to give parents all over the state — in the inner city, in the barrios — we need to give those parents the same choice of a great education that wealthy parents have. How would you rate the job Gov. Jerry Brown has done with education in California? Fair at best. He hasn’t addressed the elephant in the room, and that is the quality. He has increased education spending vastly since he has been governor, and a good chunk of that money has not gone into the classroom. Administrative costs have soared. And of course a lot of it is going to pensions, and he hasn’t dealt at all with the pension bomb. He’s continued to kick the can down the road on doing anything on pensions. That political influence is writ large in higher education as well. Higher education continues to be priced out of people’s reach. And I talk to administrators in the UC System who tell me that professors get paid nice salaries, but they don’t want to teach undergrad. Well I’m sorry, but that’s one of the reasons why education costs what it costs these days. You’ve got to get people to actually teach and work. It’s a nice luxury to have professors who just write papers all day or do consulting, but it’s driving up the cost of education for all these students who need and want an affordable education. Several Democrats have talked about wanting to increase California’s per-pupil education spending to the national average — do you agree? They have increased education spending incredibly in the last seven years, and it keeps going into administration, it keeps going into pensions. It’s not going into the classrooms — and that’s a problem. No business in the world would keep throwing money into a system where it’s not producing results, and that’s the bottom line. I certainly want a much better education system, but I know that an education system is not going to improve until we give people a reason to improve, and that reason is competition. Unfortunately, parents have almost no choice most of the time, they’re stuck with their local neighborhood school, and I think that’s reprehensible. Give them a choice and we’ll get better schools. The Local Control Funding Formula has been Brown’s signature school funding and accountability program. Would you continue with that model or make changes to it? I would question how effective it’s actually been. Again, if you look at studies that have looked at performance in this state, school performance has not done very well. I just look at results. What approach would you like to see California take to regulating charter schools? I want the control in the hands of parents, so I’ll tell you what I want the state to mandate is full transparency. I think parents need to be given full information about the school and what it’s doing and I think parents should get involved. There’s nothing like accountability from parents. I certainly think there could be some amount of testing or other accountability that’s rendered. But I think the major element of accountability is going to have to be exercised by the parents, which they should do anyway. They’re the ones who care about their kids’ education than any state bureaucrat. There are some comments you made when you were running for president in 2007 that I want to ask you about. At a Values Voters Summit forum you talked about transgender school teachers, and used a word to describe them that a lot of people consider offensive. Do you, at this point, believe that transgender teachers are dangerous, or a problem that parents should be avoiding? That was 2007. I think the world has evolved quite a bit in 11 years … I think the world has evolved to some degree since then and I don’t necessarily hold those views now. Are you saying you do not consider transgender teachers to be a danger or a problem? I don’t necessarily consider them a danger or a problem. I think it’s an issue a parent could well decide is an issue, and I think parents should have the freedom to decide that. But I frankly think someone’s sexuality should not even be brought up in a classroom situation. I think we should just be talking about reading, writing and ‘rithmetic. And other issues — we shouldn’t be talking about teachers’ sexuality one iota. It’s none of anybody’s business, frankly. At that same forum, you responded “yes” to a question that asked, “As president would you support legislation ensuring that schools forfeit federal funding if they expose our children to homosexual propaganda that puts them at risk.” Would you give the same answer to that question today? No, I don’t. I wouldn’t. Again, my feelings on that have evolved — just like Hillary Clinton and Barack Obama. I still believe that marriage is between one man and one woman, but I certainly see a place, you know, and endorse full rights of civil union and rights of partners for homosexual partners. I don’t have the same views on that as I did in 2007, just like Hillary Clinton and Barack Obama. On higher education — how should California address college affordability? Reduce the costs. You don’t make things more affordable by handing out loans and subsidies to people. You make things more affordable by increasing the competition and making things more efficient. Would you increase state funding for the University of California and California State University systems to avoid tuition increases? No – I’d tell them to get their act together and start cutting costs. Start making professors teach more classes. I would tell them to not put students more in debt. That’s not the way we should go. In that case, how would you stop those systems from raising tuition? I’m going to appoint people to the Regents who care about making education truly affordable again. I mean, we can’t keep this ever-escalating cost structure, going higher and higher and higher, and expect middle-class kids to be able to afford it. You know, it’s funny — some of the poor kids maybe have a better chance because there’s all kinds of scholarships and grants for kids. And I have nothing against that, by the way. But we’re killing middle-class families. They’re the ones that are forced to go into debt. They may get partial scholarships, but they have to borrow money. Let’s get the costs under control. But, as a new governor, you’d have limited influence over the Regents — how would you compel UC and CSU to not raise tuition? Then I’ll do what political leaders should do…and that’s lead. I get this question a lot from reporters: ‘Oh, how are you going to force these changes?’ You know, I’m not running to be emperor or something like that where I’m going to be decreeing things from on high — I’m going to go out and talk to people, and convince them to do the right thing. And the right thing should be to cut costs, get more efficient and keep tuition lower so that people can actually afford it. Where do you see the opportunity to cut costs in higher education? One of the reasons costs at our educational institutions — but all through government and, frankly, all through business — our costs have really skyrocketed is because of the cost of housing. The cost of living has been driven up mostly by political influence peddlers and corruption. And why is that a problem for higher education? Because it also drives up the cost of salaries — you need to pay people more to come to California. I want to build 3 million houses in the next 10 years. Just to give you a frame of reference, we’ve been building about 80,000 per year for the last 10 years, and the demand is about 150,000. So we’ve got a lot of catch-up to do … We’ve got to build houses. And if we build a lot of houses we’ll bring down the cost of housing, and we’ll bring down salaries, and we’ll bring down the need to pay high salaries, and then we’ll bring down the cost of local budgets, as well as school budgets. Jerry Brown has proposed tying some funding for community colleges to certain performance measures, including graduation rates and their numbers of low-income students. Is that an idea you support? I’d have to explore it. I will say that I believe colleges should be much more affordable so that people of all income levels can afford them. And then we won’t need metrics like how many low-income students go there and graduate. Tuition at California Community Colleges is already fairly inexpensive — a student can attend full-time for about $1,000 per year. Are you saying there needs to be more done to reduce tuition at the community colleges? No, that’s actually probably pretty reasonable. Are there any other topics you’d like to talk about, or other aspects of education that would be priorities for you? I know that there are some charter school billionaires that are funding (former Los Angeles Mayor Antonio) Villaraigosa, but the likelihood that Mr. Villaraigosa is going to do bold reforms, which I believe are necessary, is about zero. I’m the only one that’s talking about lessening the power of special interests, and that’s because I think that’s the biggest impediment to reform and changing the status quo. So these guys are all going to talk a good game, and that’s what they are, they’re great talkers. My opponents are politicians. My two major opponents, Mr. Villaraigosa and Mr. Newsom, left their cities basically in tatters — full of homeless camps, lousy schools and pothole-filled roads. The idea that anyone would expect them to make the bold reforms of this system is just patently ridiculous, it’s just not going to happen. And that’s the message I’m giving voters: You really want to see change you’ll vote for change — me. If you like the status quo, if you like the way things are going, go with Antonio or Gavin, because they’ll just continue the descent of the state. I’m not satisfied with that.